The Penn Street Market is one of our favorite events in Downtown Reading. 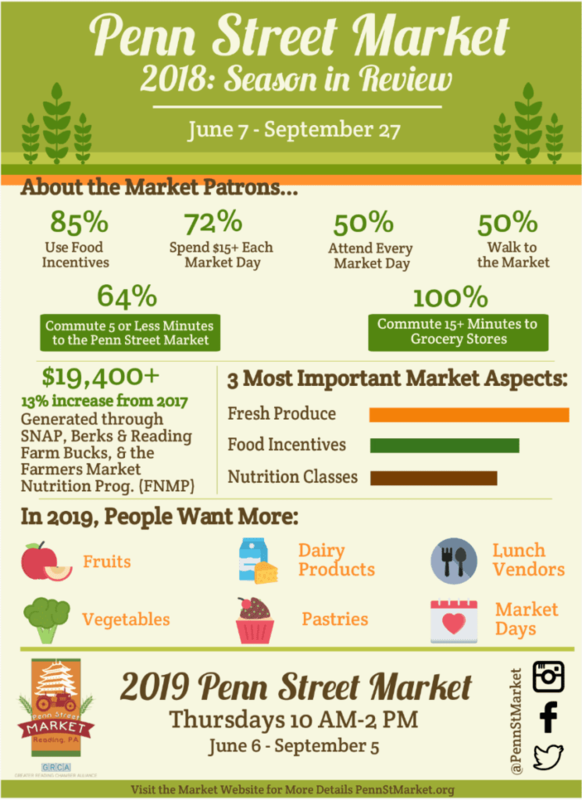 The Penn Street Market is one of the oldest running markets around. It celebrated its 250th anniversary back in 2016. For 16 weeks each year, you can walk downtown on a Thursday afternoon and visit a variety of vendors from food trucks to local farms. In 2018, $19,400+ was generated through SNAP, Berks & Reading Farm Bucks, & the Farmers Market Nutrition Prog. (FNMP). This is a 13% increase over the 2017 season! Further, survey results indicate that the Market continues to fulfill the need for easy access to fresh fruits and vegetables. We are excited about the 2019 season and want to utilize the Market as a community platform and opportunity to highlight assets in downtown Reading and the community at large. We hope to accomplish this by partnering with a variety of organizations throughout the season. The Market team is busy with planning – we welcome all questions and interest. Save the date for Thursday, June 6th to kick off the 2019 season!